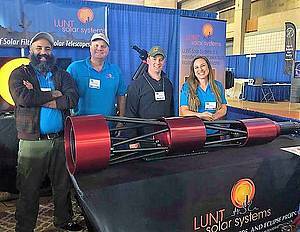 You are here: Home » News » LUNT SOLAR SYSTEMS produces the world’s largest solar telescope for NEAF show in USA! Lunt Solar Systems strives to produce the world’s finest solar viewing instruments ranging from beginner to research-grade scopes for the professional. Some time ago LUNT achieved what most believed was the top of what was achievable with the LS230THa. But boundaries are made to be challenged. The LUNT team has now created the new pinnacle of solar telescope design with the new LS300THa F7 Serrurier-Truss design single or double-stacked research-grade instrument. This scope will provide an image second to none from any currently produced solar telescope. The LS300THa has the ability to capture full disc images. With its enormous 24mm image size the eye and ccd detectors will be able to survey the sun gathering all the minute details. While double-stacked you will see unparalleled views of the entire sun with a 0.45 Angstrom filtering system. The LS300T was a Hit at NEAF!